This story was updated at 5:43 p.m. EDT. Editor's note: DARPA released an update late today confirming that the Falcon HTV-2 aircraft impacted the Pacific Ocean along its planned flight path. Read the full story here. The DARPA glider, called the Falcon Hypersonic Test Vehicle 2 (HTV-2), blasted off from Vandenberg Air Force Base in California atop a Minotaur 4 rocket at 7:45 a.m. PDT. "Range assets have lost telemetry with HTV2," DARPA officials wrote in a Twitter post about 36 minutes after launch. Monitoring stations further down range of the vehicle's flight path over the Pacific Ocean also did not find the hypersonic HTV-2 glider. The vehicle is designed to crash itself into the ocean at the end of its mission. "Downrange assets did not reacquire tracking or telemetry. HTV2 has an autonomous flight termination capability," DARPA officials wrote. Whether the test flight met all of its objecties still remains unclear, but this is the second test flight of the Falcon HTV--2 program that ended prematurely. An April 2010 test flight ended nine minutes into flight, also due to loss of contact. The HTV-2 vehicle was expected to reach suborbital space, then re-enter Earth's atmosphere and glide at hypersonic speed to demonstrate controllable flight at velocities of around Mach 20, which is about 13,000 mph. At that speed, more than 20 times the speed of sound, a vehicle could fly from New York City to Los Angeles in 12 minutes, DARPA officials said. A video animation of the HTV-2 flight test depicts how the the hypersonic vehicle was expected to pop free of its rocket, then soar through Earth's atmosphere for an inevitable, and intentional, plunge into the Pacific Ocean at the end of its mission. The HTV-2 is part of a program called Prompt Global Strike called DARPA (which is short for Defense Advanced Research Projects Agency) to develop advanced weapons systems with extreme range. For today's hypersonic flight test, the HTV-2 vehicle was expected to launch into suborbital space, separate from its Orbital Sciences Corp.-built Minotaur 4 rocket, then re-enter the atmosphere. During the re-entry phase, the vehicle was expected to use rocket thrusters to help maintain its course, according to a DARPA description. 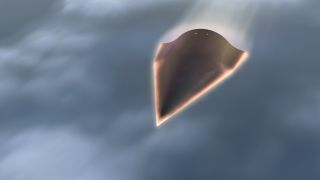 "Assumptions about Mach 20 hypersonic flight were made from physics-based computational models and simulations, wind tunnel testing, and data collected from HTV-2's first test flight — the first real data available in this flight regime at Mach 20," said Air Force Maj. Chris Schulz, HTV-2 program manager, in a statement. "It's time to conduct another flight test to validate our assumptions and gain further insight into extremely high Mach regimes that we cannot fully replicate on the ground." After the re-entry maneuver, the HTV-2 was slated to enter a pull-up phase to control its speed and altitude ahead of the long glide back to Earth. During the glide, the vehicle is programmed to perform maneuvers to test aerodynamic performance, DARPA officials said. The HTV-2 was expected to end its hypersonic test flight by performing a roll maneuver to intentionally crash into the Pacific Ocean. DARPA officials said more than 20 observing stations will monitor the entire flight from space, land, ships and aircraft. Hypersonic tests in wind tunnels on the ground can typically recreate conditions at speeds only up to Mach 15, and only for a few milliseconds at a time, Schulz said. "And even then we wouldn't know exactly what to expect based solely on the snapshots provided in ground testing," Schulz said. "Only flight testing reveals the harsh and uncertain reality." Editor's note: This story was updated to correctly reflect that the test launch occured Aug. 11.